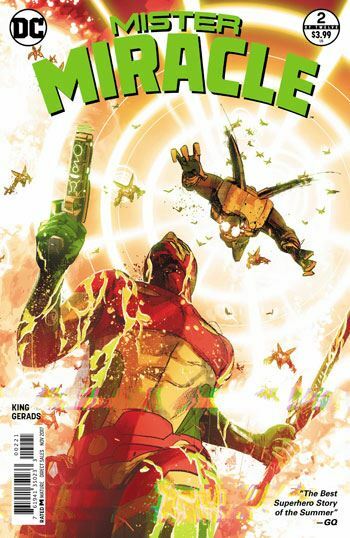 Mister Miracle, leading the combat against Apocalypse on behalf Orion, the new Highfather, has been trusted with a special mission. He and his wife Big Barda must murder Granny Goodness. Will he pull it off? 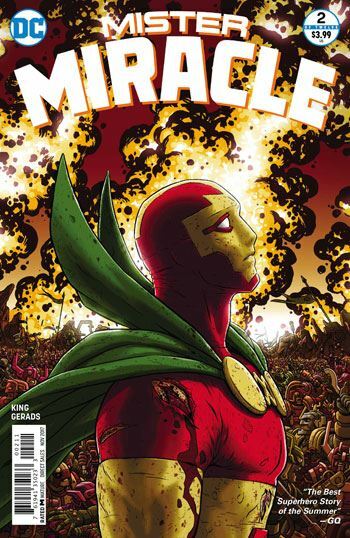 Reading this comic was overwhelming so I'll start with an analysis of the narrative techniques used by Tom King and Mitch Gerads. The nine-panel grid continues with many pauses, repetitions, and silent shots, quietly telegraphing motion and action to build up an argument, visually of course, as it sets up conflicts. The use of space is used judiciously to show the passage of time across repeating panels or others spliced from a larger canvas. Granny Goodness’s revelations are introduced in total darkness and only serve to create a sense of despair and confusion where nothing in the world of Scott Free appears to be what it is. Orion seems as despicable as his father, and Barda seems like the only ally that Scott can rely on. It is at that moment that once can witness the greatness of the Fourth World characters created by Jack Kirby. That so many layers could be hidden in such silly and colourful characters is humbling. Jack Kirby was more than a genius. Tom King can tap into deep material and make it seem as tragic as anything by Racine or Shakespeare. Enjoy this comic. Mitch Gerads appears to be using modified photo backgrounds for some of his sombre sets but it does not matter if he does. Kirby also did but did not have the benefit of Photoshop to make it look as good.